On Friday April 5th, the 7th and 8th graders at Wayne Middle School participated in Reality Town. Reality Town is an educational program that gives realistic financial experience to middle and high school students. Many schools around the country participate in this program and are already giving their students an edge in the real world. The program is a two-hour simulation that was held in the Middle School gym. 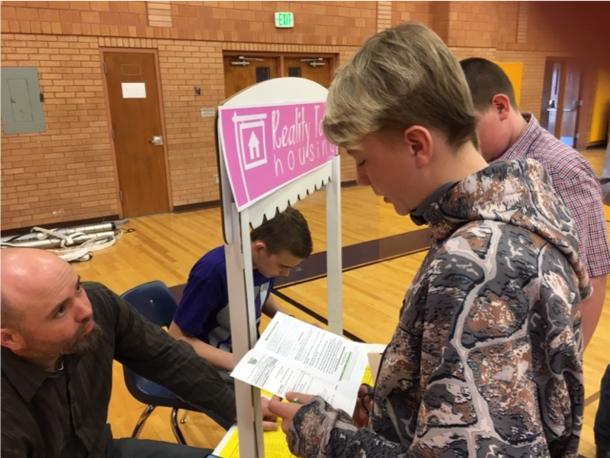 Before entering Reality Town, students received a handbook and personalized pay stub which contained information about their Reality Town family. Students were selected for a job based on their GPA. They got a chance to see if they could support a family on the salary of their job. As part of the preparation for the Reality Town Simulation, students learned about loans and tax withholding as they examine their personalized pay stub. Members of the community and FFA students from the high school manned booths that simulated all aspects of the students’ financial life. They visited banks, car dealers, realtors, insurance agents, communication companies and other businesses that they would visit in real life. The students had to adjust their purchases to meet the realities of life. They enjoyed the experience, though several students were disappointed that they did not make enough money to buy a big truck. This was a good experience that allowed the students to learn about where their money goes and how their choices determine their lifestyle. They also learned that how well they do in school will impact their earning potential. We would like to thank Wayne Middle School for sponsoring the event and Candance Peterson and Jennifer Hunt for setting up the experience. 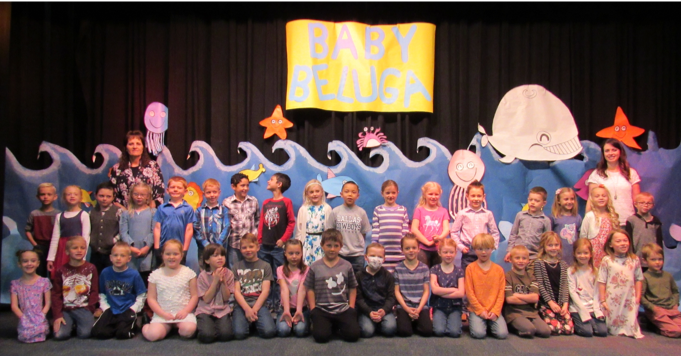 The combined first grade classes of Mrs. Brinkerhoff and Mrs. Potter at Loa Elementary did a masterful job of presenting the play “Baby Beluga” on Friday, March 31st. They have been practicing for weeks to make the play a great experience for the school and the community. 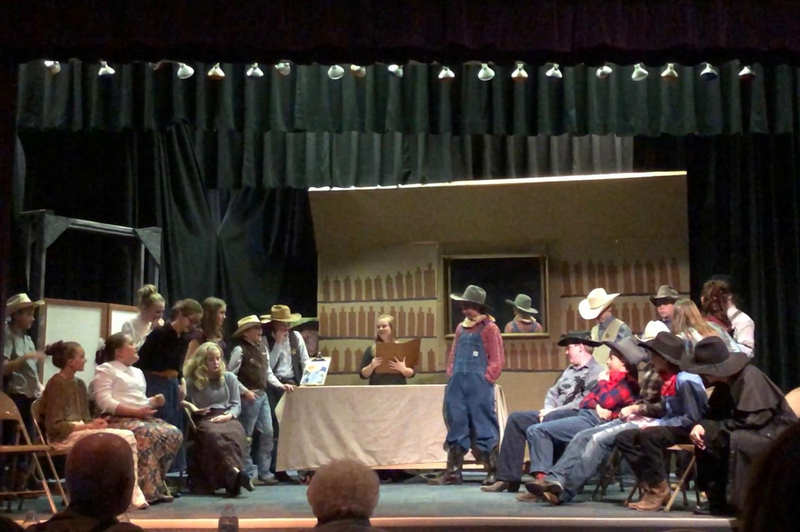 In the presentation, students not only sang and acted out songs, but had speaking parts which set up the next song and stage of the play. Both classes worked hard under the skillful direction of Mrs. Brinkerhoff and Mrs. Potter to carry off the performance without a hitch—providing lots of energy and spirit. “Baby Beluga” was a smash hit performance for all in attendance! 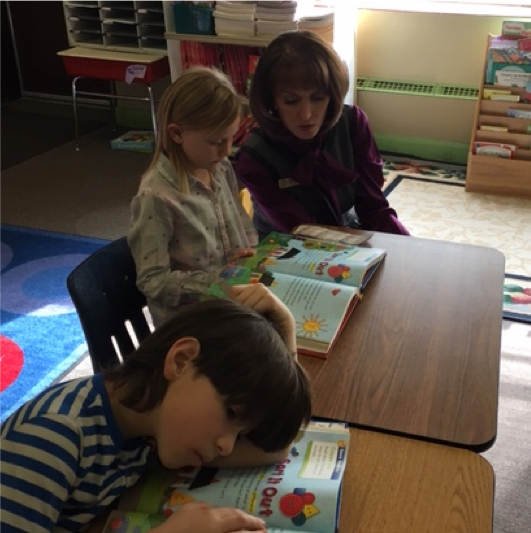 On Wednesday, March 18, 2019 Dr. Sydnee Dickson the State Superintendent of Public Instruction visited the schools in Wayne School District. She has made it one of her goals to visit each district in the state. Dr. Dickson visited Loa Elementary, Wayne High School and Wayne Middle School. While in the schools she visited classrooms, and spoke with students, teachers and principals. She expressed how impressed she was with the teachers’ high-quality instruction and how the students were positive and engaged in their classes. Dr. Dickson was enthralled with the good feeling in each school and was pleased with the students’ energy. We also had a chance to discuss issues that affect education in our rural community, primarily student safety. Dr. Dickson has the same concern as us on student and community mental health and will continue to support initiatives that increase the number of mental health professionals in rural areas. We also discussed the difficulty of funding education in rural Utah and what initiatives the state has to assist the rural districts. Wayne School District provides the students with many forms of learning. While we focus on the academic skills students need, we also feel strongly about providing an appreciation of the arts. 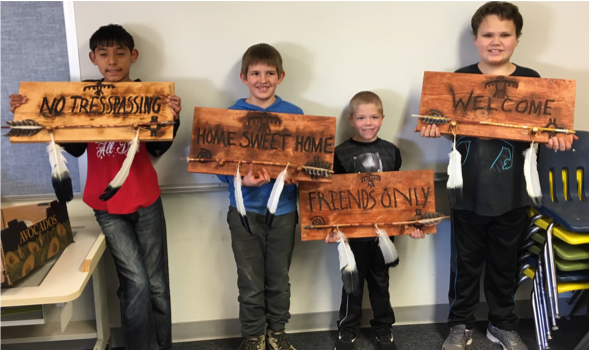 This week Hanksville Elementary invited Fred Weihing to assist the students create wooden door signs for each student. The students drew welcoming words on the wood which Fred burning into the wood. The students then built arrows to put on pegs the students put into the signs. Then the students stained the wood to make a very attractive display. The students learned about safety, building, painting and creativity. The students also made an Atlatl (spear thrower). Fred will come to HES 2 more times this year to help the students make interesting and informative art projects. We would like to thank Mrs. Wilkins for bringing this exciting opportunity to the students in Hanksville. 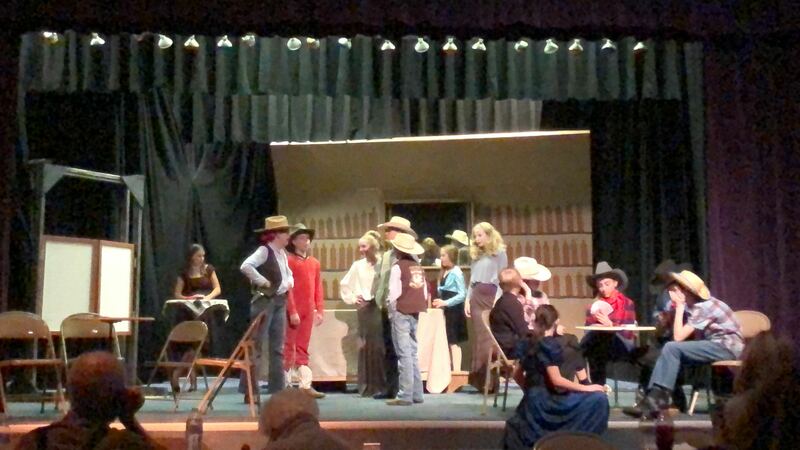 WMS Play 2019 - Who Shot The Sheriff? 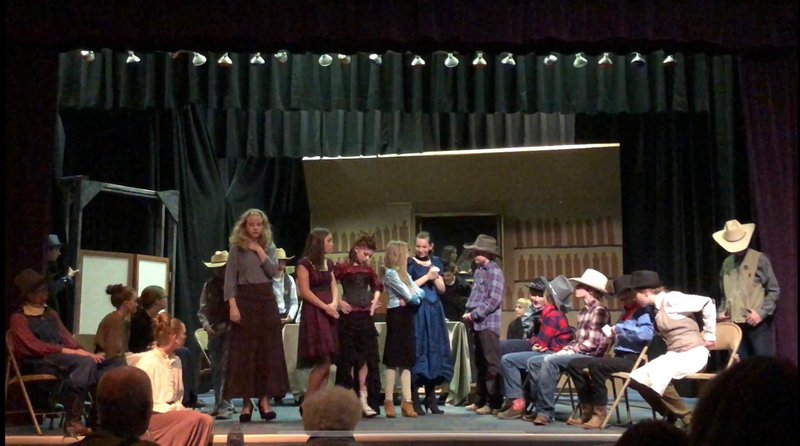 The play takes place in a small town in territorial Wayne County in the late 1800’s, when someone in the town shot Sheriff Dan. After the unfortunate shooting of the county Sheriff, Sheriff Dan, no one was quite sure what to do. Miss Samantha, a concerned citizen, rode out of town to find a new Sheriff. To the surprise of the townsfolks, Sheriff Sam Purdy came to their rescue. The play’s plot progresses in an attempt to find out who shot Sheriff Dan. Was it Miss Twitty, the owner of the Sarsaparilla Saloon, Frank the bartender, or maybe the old prospector, Smiley? In the end, it was an unexpected character, Lily Bell, who was responsible for the shooting. If you weren’t able to attend, you really missed out! Beginning Monday, February 4th, CUES region will be administering online school surveys. All parents or guardians of current students are invited to participate. The purpose of the survey is to gather feedback about teachers, principals, and schools based on interactions during the 2018-2019 school year. Responses are anonymous and no personal information is collected.Please include productive respectful, and helpful input. We seek to improve our school and make it a positive place for all students, parents and community members. Results will be given to teachers and administrators and used to improve classrooms and schools. The surveys take about 10 minutes. You may take the survey on any computer or device that has web access. You are also welcome take the survey on a school computer. The survey is available in English and Spanish. There is also a link to the survey on the school and district websites. This survey will be open through Friday, February 22nd. You may receive more than one invitation or reminder to take the survey, but please take the survey only once per school. Only select the teachers your student(s) have classes with this academic year (2018-2019). If you have more than one child at the same school, please only take the survey once. You will have the opportunity to provide feedback for multiple teachers at the school. If you have children attending multiple schools, please only take the survey once per school. You will have the opportunity to provide feedback for multiple teachers at each school. Comments will be shared with administrators and teachers in their original form. If you wish to remain anonymous, please do not provide any information that may directly or indirectly identify you (ex. : your name, your child’s name, your child’s gender, details of a specific incident or conversation, etc.). 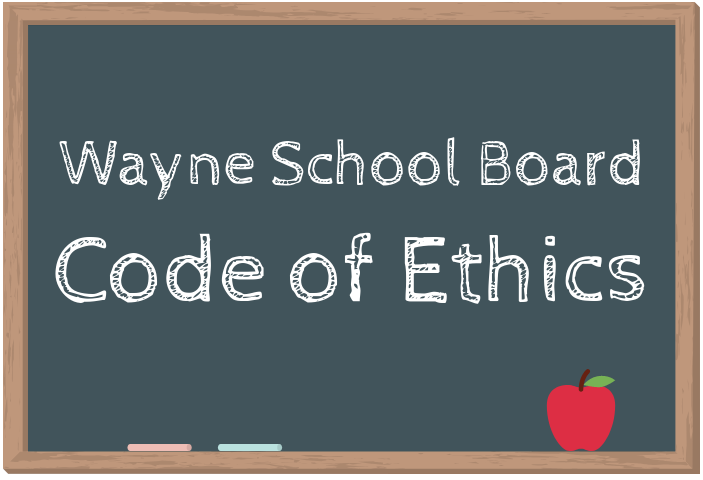 Wayne School District is committed to making waynesd.org compliant with the Americans with Disabilities Act (ADA). At this time we recognize that not all areas of our website are ADA compliant. We are currently in the process of redesigning and creating new website content to be compliant with the W3C Level Two guidelines.